These polypropylene bags are heavier & easily last twice as long outside as lightweight white poly bags. Filled with sand & gravel mix. Bags average 30-35 lbs. each. If you have specific weight needs, let us know. Treated with 1600 hour UVI (ultraviolet inhibitors) and have untamped filled dimensions of approx. 16"L x 12"W x 4"H. Colors include high-visibility orange, low-visibility desert tan and green, or white. If you don't state a preference, we'll use whatever color bags we have at hand. Price $3.00 per bag, will-call (you pick up). See below for delivery & commercial payment terms. Volume discounting available. over 20 pallets - call or email us. Prices are FOB; we'll load you up. Please be aware that a standard pallet of sandbags = 75 bags (averaging 30-35 lbs. each) and has a gross weight of about 2,550 lbs. 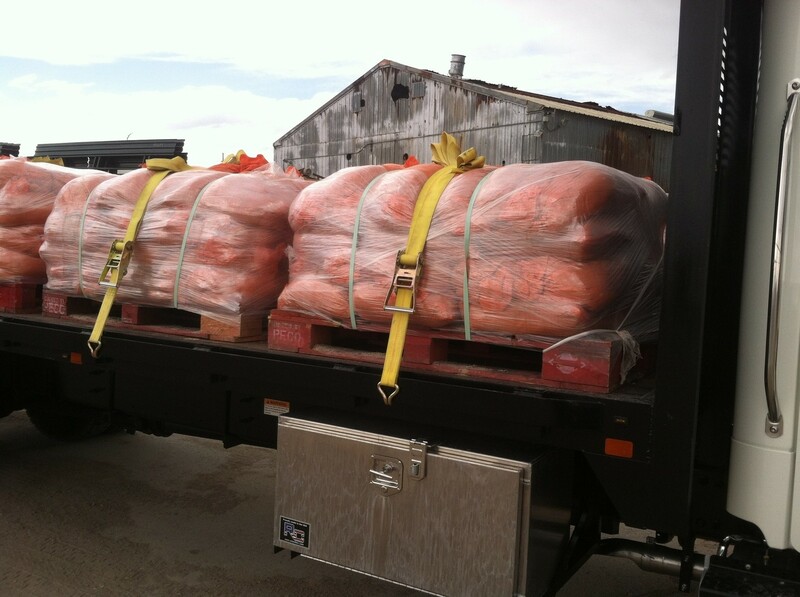 A truckload is 20 pallets with a gross weight of about 48,000 lbs. Because polypropylene sandbags can be subject to degradation in our climate and at our altitude, we as a rule don't make up & stockpile bags in advance. Instead, we fill them to order to ensure you with bags that have an optimum lifespan. For this reason, we ask reasonable lead time to fill & deliver your order. Rush orders (24/7) may be possible; surcharges will apply. Call or text us at 505-750-3478, or email us at info@nmdirtbags.com & we'll give you a quote. Small orders generally cost $1.00 per bag if within the Albuquerque metro area. For larger orders or delivery out-of-town, charges will be calculated based on size of purchase, your location and how soon you need them. Invoicing is an option for large and/or repeat orders; don't hesitate to ask. Depending on order size, we may request an advance deposit. Approved business checks and major credit cards are welcome. 3% surcharge on credit card payments over $1,000.